looking for a nice brunch place? look no further than jane's restaurant in bucktown. per the website : "janes ... remains true to its mission to provide tasteful & innovative cuisine -- using simple & fresh ingredients -- in a pleasing atmosphere." simple & fresh. my kinda place. 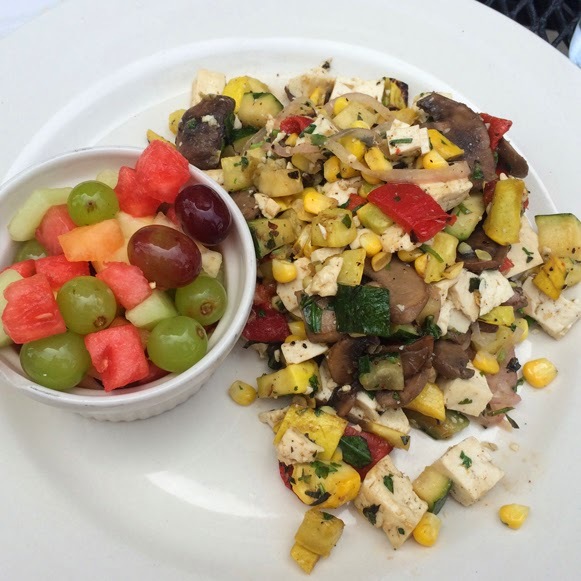 red peppers, mushrooms, yellow squash, zucchini & corn with a side of fruit. okay, the veggies are premixed so you can't get no mushrooms. not a deal breaker, since it's the only vegan item on the brunch menu ... i could pick them out pretty easily & they didn't contaminate the rest of the plate. in fact, the flavors were really, really good. like i said, jane's is a great place for brunch. it's super cute on the inside & has a nice outdoor area for summer. they've got a couple other vegan items on their non-brunch menu, so i'll probably be back for more. definitely worth checking out.